NOTES: 2008 Limited Edition reissued this year. The A6M was a nasty surprise to Allied airmen when it was first met during the early months of WWII in the Pacific. Despite being forewarned about this new fighter by Clair Chennault in 1941, US brass chose to ignore his analysis, hence the big surprise. Eventually tactics were developed that helped to mollify the advantages of the Zero, but it remained a viable threat through 1942 and into 1943. 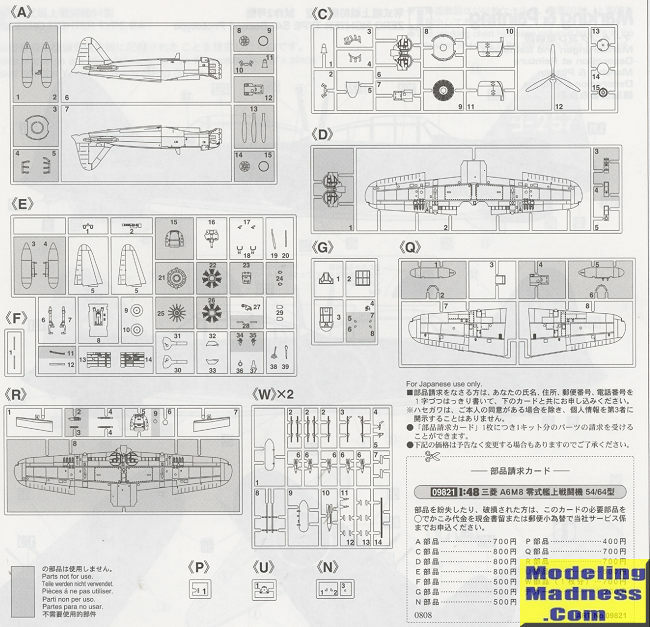 However, Mitsubishi was unable to come up with a viable replacement until very late in the war and even then the A7M was never flown beyond the prototype stage. This meant a constant battle to improve what they had. Adding equipment and pilot safety features to the plane only made it slower and less nimble. One final attempt was the A6M8. 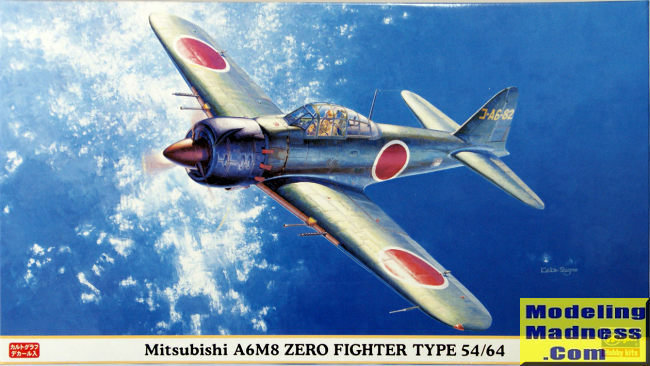 Similar to the A6M6 (which was the first Zero variant with self sealing fuel tanks) but with the Sakae (now out of production) replaced by the Mitsubishi Kinsei 62 engine with 1,163 kW (1,560 hp), 60% more powerful than the engine of the A6M2. This resulted in an extensively modified cowling and nose for the aircraft. The carburetor intake was much larger, a long duct like that on the Nakajima B6N Tenzan was added, and a large spinner—like that on the Yokosuka D4Y Suisei with the Kinsei 62—was mounted. The larger cowling meant deletion of the fuselage-mounted machine gun, but armament was otherwise unchanged from the Model 52 Hei (2 x 20 mm cannon; 2 x 13 mm/.51 in MG). In addition, the Model 64 was modified to carry two 150 l (40 US gal) drop tanks on either wing in order to permit the mounting of a 250 kg (550 lb) bomb on the underside of the fuselage. Two prototypes were completed in April 1945 but the chaotic situation of Japanese industry and the end of the war obstructed the start of the ambitious program of production for 6,300 machines, none being completed. This kit comes in a fairly full box. There are different sprues for this variant which includes a new lower wing, new wing fuel tanks, rocket racks and various size rockets, new engine and cowling, main gear well, spinner and prop to rattle off the most obvious ones. The cockpit is the same as we've seen in Hasegawa 1/48 A6Ms since this molding first hit the streets. That is to say it is very good and the only thing it really needs is a seat belt/harness. There are raised details for the instruments and decals to fit over them. Note that this version has no cowl machine guns so you'll have to fill the holes for the breeches. There are various other holes that need to be opened in the fuselage, including one for a small window. Though this has a new cowling, it is in two halves so you'll need to deal with a seam. There is a one-piece prop that goes with this with the larger spinner so no individual blades. The wing is the biggest change. It is the one that has the reinforcements on the underside and is able to take either wing fuel tanks or various rocket options. The open framework can handle (on each side) one large rocket, two small rockets or four small rockets. Like the other versions, there are separate (lowered) flaps. No tail hook or center fuselage fuel tank so there are inserts for those. The canopy is in three pieces so you can pose it open though I think the sliding portion may be a tad thick. Instructions are standard stuff with Gunze paint references. Both markings options are green over light grey with leading edge ID markings. These latter items will need to be painted on as the area is fairly convoluted and a decal just wouldn't do it justice. 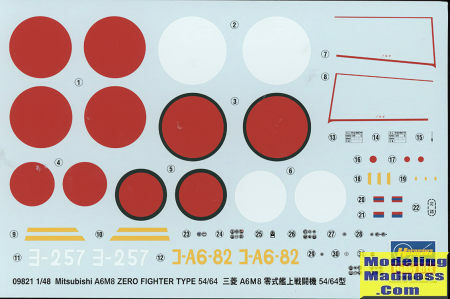 Markings are for one of the prototypes as shown on the box art. The other is with the Yokosuka Naval Flying Group, which I think was as much a training command as it was an operational one. I'm not sure how many of these were made, but I'm betting not all that many. Decals are nicely printed and as good as most aftermarket sheets. The one set of roundels has separate white backgrounds. These respond well to most setting solutions. Those who are building a collection of A6Ms in this scale will want to add this one to the stash. As a personal note, I ordered this from an overseas seller who offered 'free' shipping. Well that free shipping came with a price as he used a super flimsy box and this kit along with another arrived rather badly crushed in the process. Stick with the 'big boys' when buying from overseas. Your additional shipping costs will get you a nice, sturdy, box. Header photo was snagged from the net and is not the box top of my kit.